Both Tamimi and her mother were sentenced to eight months in an Israeli military court. PALESTINIAN TEENAGER AHED Tamimi has been released from prison after an eight-month sentence for slapping two Israeli soldiers, an episode captured on video that made her a symbol of resistance for Palestinians. Tamimi, 17, and her mother Nariman were driven from the Sharon prison inside Israel to a checkpoint leading to the occupied West Bank, where they live, prison spokesman Assaf Librati said. They were then handed over to Israeli soldiers, he said, who brought them to their village of Nabi Saleh. After being released by the soldiers, Tamimi made brief comments to crowds and journalists gathered, saying she hoped everyone would come to a news conference later in the day. Her father Bassem put his arms around the two of them as they walked together along the road, the crowd chanting “we want to live in freedom”. Family members and supporters had also gathered at the checkpoint to greet them, but the military vehicles driving them did not stop there and continued into the West Bank. Israeli authorities appeared keen to avoid media coverage as much as possible, and conflicting information had meant supporters and journalists scrambled to arrive on time at the correct location. Tamimi and her mother were first expected to arrive at a checkpoint near the Palestinian city of Tulkarm in the West Bank, but the location was changed three times before it was finally announced they were being taken to a crossing at Rantis, about an hour’s drive away. There had been slight tension at the checkpoint before Tamimi’s arrival as a few men with Israeli flags approached supporters holding a Palestinian flags. Words were exchanged but there was no violence. In a sign of the sensitivity of the case, yesterday Israeli authorities arrested two Italians and a Palestinian for painting Tamimi’s now-familiar image on the Israeli separation wall cutting off the West Bank. Both Tamimi and her mother were sentenced to eight months in an Israeli military court following a plea deal over the December incident, which the family said took place in their yard in Nabi Saleh. Video of it went viral, leading Palestinians to view her as a hero standing up to Israel’s occupation. Palestinian president Mahmud Abbas has praised her and social media has been flooded with support. But for Israelis, Tamimi is being used by her activist family as a pawn in staged provocations. They point to a series of previous such incidents involving her, with older pictures of her confronting soldiers widely shared online. Many Israelis also praised the restraint of the soldiers, who remained calm throughout, though others said her actions merited a tougher response. 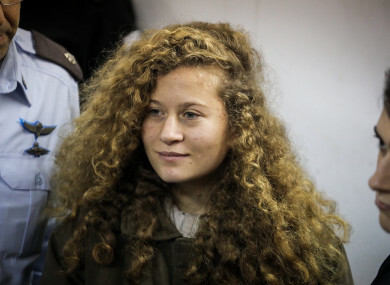 Tamimi was arrested in the early hours of 19 December, four days after the incident. She was 16 at the time. Her mother Nariman was also arrested, as was her cousin Nour, who was freed in March. Israel’s military said the soldiers were in the area on the day of the incident to prevent Palestinians from throwing stones at Israeli motorists. The video shows the cousins approaching two soldiers and telling them to leave before shoving, kicking and slapping them. Ahed Tamimi is the most aggressive of the two in the video. The heavily armed soldiers do not respond in the face of what appears to be an attempt to provoke rather than seriously harm them. They then move backwards after Nariman Tamimi becomes involved. The scuffle took place amid clashes and protests against US President Donald Trump’s controversial recognition of Jerusalem as Israel’s capital. Relatives say that a member of the Tamimi family was wounded in the head by a rubber bullet fired during those protests. Comments on this article have been disabled due to the large amount of comments flagged. Email “Palestinian teenager jailed for slapping soldiers released from prison after eight month sentence”. Feedback on “Palestinian teenager jailed for slapping soldiers released from prison after eight month sentence”.